Thursday, April 27, was the first spring day that crept toward 80 degrees in Middlebury. The sun beamed, folks lounged on porches, a wood thrush chimed in just-greening branches and the line for creemees at Sama's Café stretched along the curb. But inside the Champlain Valley Unitarian Universalist Society, sunlight from the floor-to-ceiling windows didn't overheat the room where a small group of locals gathered over tea, cake and sugar cookies. They had come to talk about death. Those are the only requisites at Death Café: eat cake, drink tea and discuss dying. The aim, according to the international nonprofit's website, is to increase awareness of death "as a way of helping people make the most of their (finite) lives." The discussions have no agendas or themes, and are not intended as grief support or counseling sessions. There is no attempt to lead participants to specific conclusions or courses of action. The only consistent ingredient is cake. Death Café was founded by Jon Underwood, a web designer in Hackney, England; and his mother, Sue Barsky Reid, a Gestalt psychotherapist and counselor. It draws inspiration from the writings of Swiss sociologist Bernard Crettaz, who organized "cafés mortels" in the late '90s to champion open cultural dialogue about death and dying. Today, Death Café is a social franchise, meaning that people who sign up to host in their areas can organize local gatherings under the Death Café name and speak to media as affiliates. Since Underwood and Reid's first such meeting in September 2011 — in Underwood's basement — there have been nearly 4,500 Death Café events in 49 countries. Some meetings took place in Burlington this past year, at Dobrá Tea and the Fletcher Free Library. Last Thursday evening, Helen Young, a biology professor at Middlebury College; and Kate Gridley, a local artist, cohosted Middlebury's first meeting, from 5:30 to 7 p.m.
"I'm interested in alternatives to death in a hospital or nursing home," said Young via phone on the afternoon before the gathering. "Death Café came up somewhere online, and I thought it was a great way to have a pretty open-ended conversation about death and dying." In Bristol, Young has been trying to start a natural burial ground — a cemetery that extends to natural habitats, such as nearby woods, without disrupting the ecosystem. It would be a place for "green burial," which allows the body to decompose naturally, recycling itself back to the environment. That means no embalming or headstones, fixtures of modern death that, for many people, have become standard practice rather than conscious choice. "Dying is expensive," Young said. "Most of someone's health expenses are often paid in the last weeks of their life." According to several online sources, the U.S. funeral market grosses about $20 billion annually; the average cost of a funeral in 2017 is $8,000 to $10,000. "I'm not an authority," said Young. "I'm just curious about learning alternatives to what most people think are the only ways of dying, and being taken care of after you die. But the whole goal of Death Café is to have an organic conversation flowing from the people who attend." 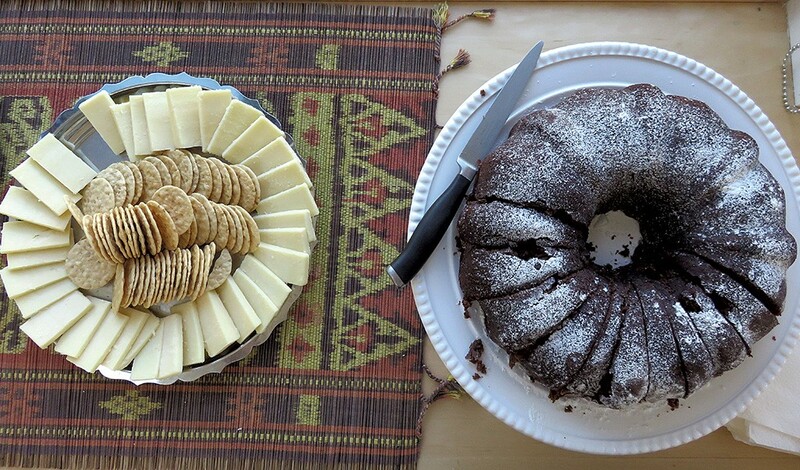 Thursday's Death Café started with greetings and chatter over baked goods — including cake. On a wide windowsill sat a bowl of oranges, alongside red grapes, molasses cookies, cheddar cheese and crackers, coconut macaroons and sugar cookies made with cream cheese and lemon. The bright atmosphere belied the discussion topic. The meeting, per Death Café's suggestion to hosts, had no hierarchy, theme or guidelines. Young and Gridley offered enough leadership to get the ball rolling: They provided the requisite snacks, arranged chairs in a circle on the sunny side of the room and gave a brief history of Death Café's development. Beyond that, the hosts were there simply as participants in the conversation. The group was modest — 15 people — with an age range from twenties to eighties. A microphone was passed, and participants were encouraged to answer the straightforward question "Why are you here?" "We live in a death-phobic society," said one woman. "But the more I thought about death, the richer life became." A man told the story of his mother's death two years earlier. He kept her coffin at home so relatives could trickle in, light candles and spend time with their departed loved one. A day before the funeral, they brought the wooden casket outside and sprinkled birdseed on top. "She loved birds," the man explained. "And the birds seemed never to leave it." One participant mentioned wanting to become a death doula — someone who is certified to assist the dying and their loved ones, on the premise that death requires as much attention to the mind as it does to the body. Someone else made a joking aside about the "mortuary Mafia" — funeral operators who treat death as a way to pad their bottom line. Another participant raised the question: How does one talk about death to children? In response, a group member recalled going to her grandfather's funeral at age 8. "I remember he didn't look like himself," she said, "and I was wearing a coral dress. Everyone else was in black. I had no idea how to react." When the microphone was handed to an older woman in the circle, she paused, clearly emotional, and cleared her throat. The stranger beside her reached over and gently squeezed her arm. "I knew I wanted to come," said the woman quietly. "So I'm here." She passed the mic to the next person, and the conversation continued. Death has no rules, qualifications or agenda, other than its inevitability. And at Death Café, discussion of that unpredictable event inevitably features refreshments. After the Middlebury meeting, participants lived up to Crettaz's observation that "nothing marks the community of the living like sharing food and drink." They chatted, refilled their mugs, nibbled cookies and sliced into the sugar-dusted cake on the windowsill. There was talk of weekend plans, visiting family, and a book called Last Rights: Rescuing the End of Life From the Medical System by Vermont author Stephen P. Kiernan. The cake was a spiced applesauce bundt with cranberries. The original print version of this article was headlined "An End-of-Life Discussion, With Cake, in Middlebury"